Sautéed Brussels Sprouts are not just for Thanksgiving. Enjoy these easy and delicious Sautéed Brussels Sprouts with Lemon, Garlic, and Red Chili Flakes all year thanks to this easy to follow recipe. 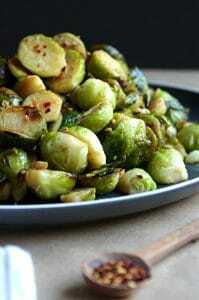 Keyword: How to sauté Brussel Sprouts, What is the best way to cook Brussels Sprouts? Heat olive oil in a large skillet over medium-high heat until oil is warm and shimmering. Add the Brussels sprouts, stirring occasionally to prevent burning, some caramelization is ok.
Sauté until fork tender, continuing to stir occasionally. I like my Brussels sprouts on the softer side, so I cooked mine for a little longer (approx. 20 minutes). Reduce heat to medium-low. Add the butter, chili flakes, and garlic. Mix well. Remove from heat and stir in the fresh lemon juice, lemon zest, and season with salt and pepper, to taste.